In the far-flung future of 1990, an international space agency receives a distress call from a downed alien craft. The vessel held an alien ambassador who was sent to Earth, but has crashed on Mars. A rescue crew eventually finds a lone alien survivor, a beautiful green feminine creature who doesn’t speak or eat food. She does, however, smile a lot and has a rather hypnotic gaze. Once the astronauts find out what she does actually eat, they are faced with a dilemma, do they kill her, or do they look for a way to satisfy her unquenchable thirst for blood? It! The Terror from Beyond Space (1958) is often cited as the main influence for Alien (1979), but after viewing Queen of Blood, I would say it was just as important an influence, maybe even more so. Whereas, It! captured the idea of a space crew being trapped on-board a ship with a deadly alien, Queen of Blood immerses itself in body horror, an element which is key to the success of Alien. 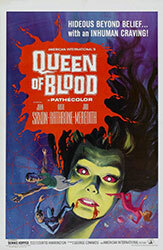 While Queen of Blood certainly never reaches the grotesque heights of its descendant, there is a quiet horror in the vampiric nature of the alien who appears humanoid but is most decidedly not human. "His reception is bad, I'm going to jiggle his antenna." Roger Corman funded this film and several of his productions from this era reused footage from Soviet science-fiction films. Queen of Blood takes a few of its space scenes from Mechte Navstrechu (1963), largely the beautiful model effects. It has definitely whet my appetite to see some more of that original film. Queen of Blood is mostly confined to the interior of a single ship. 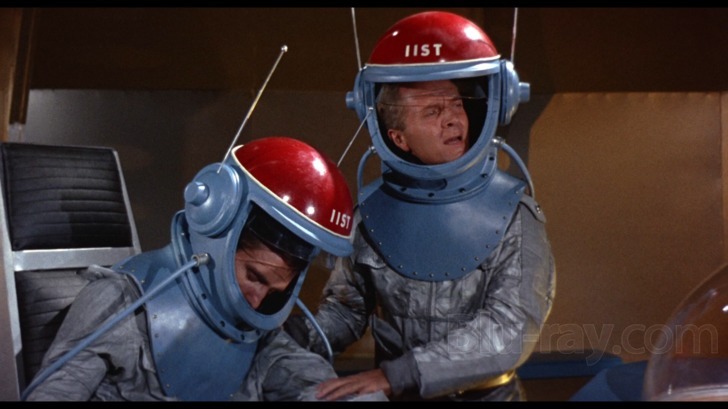 The set designs and costumes are pretty typical for the era, the sole exception being the Alien Queen’s astounding fancy space helmet and her pointy beehive. Her make-up is a simple light green body paint, but there are a few sequences where her eyes light-up in an eerie manner that is unexpectedly effective. It’s always a treat to see Dennis Hopper and John Saxon on screen, and here we even get to see them together for a brief period. Their approaches to the film couldn’t be more opposed, we see John Saxon attacking each scene with a seriousness and gravitas that the material might not deserve, but is so much the better for it. Hopper on the other hand, can be seen barely keeping from laughing, but there is still an undeniable charm and energy in his performance. Florence Marly plays the (mostly) mute Alien Queen and she does marvelous job of creating a character who is remote, alluring, horrifying and ultimately pitiable. "My eyes are up here, pal."